Battery dischargers pro NiCd baterie. Battery dischargers are designed to discharge the battery to zero as preparation for charging or for measuring its capacity. 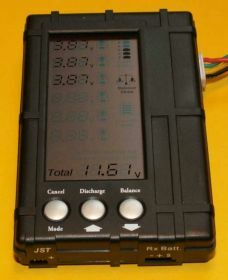 Basic description: balancer and voltage meter, for 2 to 6 cell Li-Po or LiFe, powered directly from the measured battery. 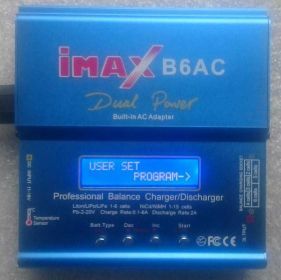 Basic description: micro processor controlled charger with built-in graphic display and balancing, for NiCd, NiMH, Li-Po, Li-Ion, Li-Fe and lead batteries. Power supply 12 V, charge power 50 W, discharge power 5 W.